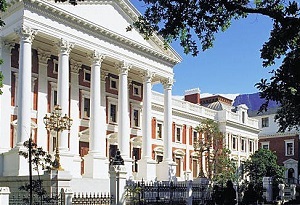 The National Assembly which is located in Cape Town, Western Cape Province has 400 members. The number of seats that a party has in the Assembly is in proportion to the number of voters that voted for it in the elections and the members are elected every five years. Currently the Assembly is made up of representative from 16 political parties. In the first elections in South Africa's first non-racial election in 1994 the African National Congress (ANC) secured 251 of the 400 seats followed by the National Party (NP) with 82 seats, and the Inkatha Freedom Party (IFP) which obtained 42 seats. The National Assembly seats after second general elections in 1999 saw the ANC dominating again with 266 seats, and Democatic Party (DP) secured 38 seats. IFP and New National Party (NNP) obtained 34 and 28 seats respectively. The 2004 elections saw the ANC dominating the results for the third time and even increased its member seats to 279 while the DP and IFP secured 50 and 28 seats respectively. In 2009 National Assembly election results saw the ANC securing 264 seats, followed by Democratic Alliance (DA) and Congress of the People (COPE) with 67 and 30 seats respectively. IFP secured 18 seats in 2009 elections.